The final feature is perhaps the most important, but we found it to be the most difficult to design. 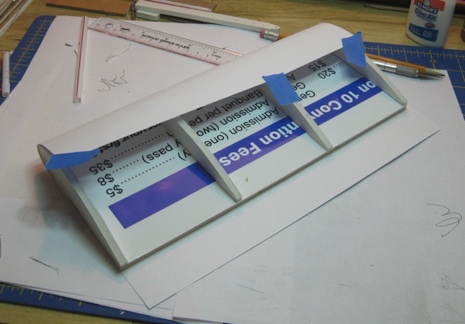 The desire is to install a wing section (airfoil) to demonstrate lift and actually measure it. The minimum goal would be to show that a real airfoil shape generates more lift that a flat slab. After several sessions of trial and error, we came up with a balance design. This concept has the weight of the wing on one side and a spring on the other side. See sketch below. The idea is to set up the balance so the assembly (wing and lever arm) is level with no air flow. The will all depend on the weight of the wing, the length of the arm, the type of spring, etc. You can add some weight (here, it is a small bag with fishing weights) to balance the arm, per the sketch below. When the air is turned on, the wing will tend to lift. At that point, you can add more weight to the bag to balance the arm back to a level position. The amount of added weight is a measure of how much lift is being generated. Using this method provides a way to quantitatively measure the amount of lift generated by the test airfoil in the wind tunnel. So how do you build such a balance? We tried to keep it simple and inexpensive. All the “arms” and the wing support are made from ¼ inch thick foamboard. A ¼ inch dowel is the main pivot for the arm assembly. In our design, we used a spring from a ballpoint pen. Pieces of paper clips attach the spring and bag, with the ends just poked into holes in the cardboard tunnel. The arm holding the wing actually has a slot so that different airfoil shapes can be swapped out. Sewing pins are used to secure the different wings to the main arm. There are many ways this can be built. 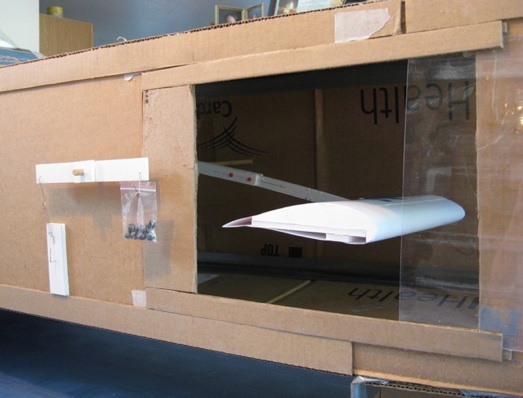 The photo below shows a proof-of-concept assembly that shows the idea using a flat slab wing section. The following photos show this implemented in the wind tunnel. An overall view of the test article. Note the dowel that goes across the entire width of the tunnel. The main balance arm (at left, on the outside of the tunnel) is glued to this dowel, as is the main arm holding the wing. This results in everything moving as a single assembly. You can also see the cardboard track for the sliding clear window. The photo below shows the external arm assembly in more detail. The arm is glued solidly to the dowel. The inner arm (holding the wing) is also solidly glued, but you will note that it is sagging due to the weight of the wing. The inner arm was initially glued in parallel to the outer balance arm, but the dowel twists with the weight of the airfoil. The wing section in the above photos was made from a base of foamboard. An airfoil section was cut from more foamboard and glued on. Two sheets of cardstock were used to cover the wing. A toothpick pivot was used to attach the wing to a support stem. It is fairly simple to make the air foil with an adjustable angle of attack. The support arm comes from the rear of the airfoil (wing). 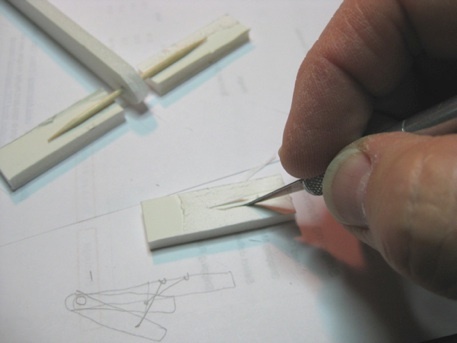 The wing pivots using paper clip wire (or a toothpick) and masking tape (see photos below). Multiple attach points on the support arm allow the wing to pivot at different angles. 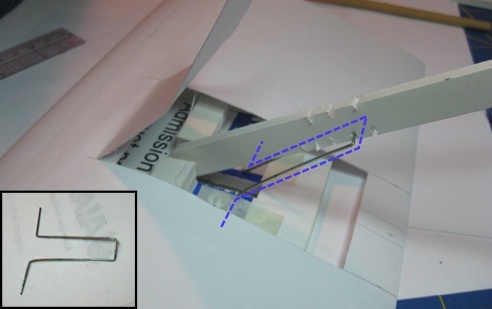 The photos below shows a close up of the wire (bent paper clip) used for this pivot on a flat slab test wing and then the airfoil shape. The arm holding this flat slab pivots on a straight piece of paper clip wire taped down. Another piece of wire pokes into the support arm to adjust the angle. Note the pins attaching the wing to the main support stem going off to the right. This can also be used to change the length of the wing from the pivot, which helps adjust the overall balance. The arm holding the airfoil-shaped wing section can also pivot on a toothpick, as we found that paper clip wire is too loose. 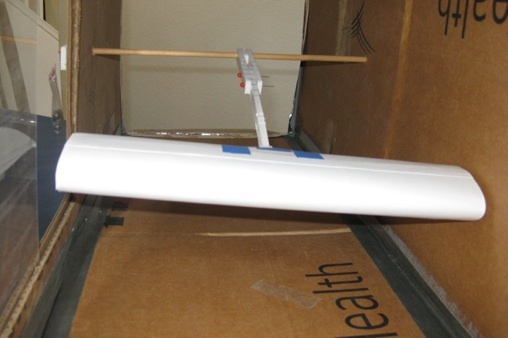 It is lodged between some foam board inside the airfoil shape. The arm has notches to adjust the angle of attack. The flat slab had a wire poking into holes on one side only. This version has a longer piece of wire (inset), taped down on the wing on both sides that fits into the notches. The main dowel is the pivot for the entire balance, and it rotates freely in holes punched in the sides of the wind tunnel (photo below). Again, the exact height or location is not critical. So overall, that’s really it. 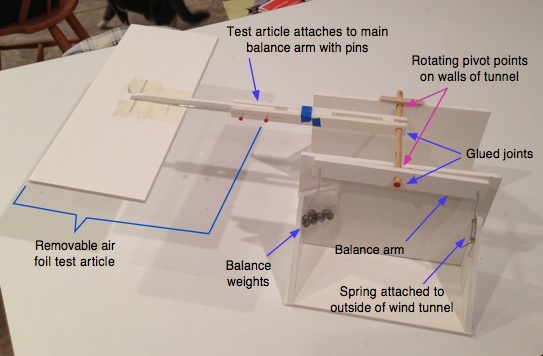 Now you have a wind tunnel with a test balance that you can compare the lift of different shapes. You can also adjust the angle of attack and measure how much difference that makes.